Suffer From Bad Acne, Eczema, Oily Skin or Blackheads? You can... – Juka's Organic Co. Suffer From Bad Acne, Eczema, Oily Skin or Blackheads? You can finally put these skin issues behind you if you buy Juka’s Organic African Black Soap from the Motherland. Our Black Soap IS NOT the imitated kind like most soaps made in the West & sold as black soap. This black soap is the original black soap. It is made in Africa by our women partners from small villages. 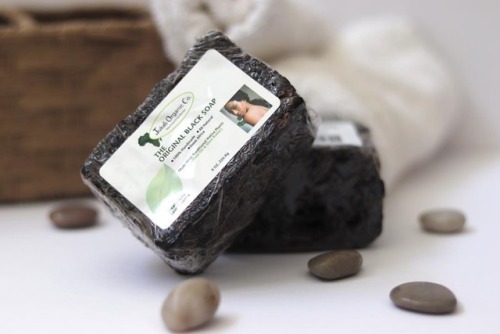 For hundreds of years, women of West Africa have found a natural way to make the residue of tropical plants into their own soaps now known as Black Soap.Whether you have dry skin, oily skin, or a combination of the two, African black soap works wonders for every skin type. Our blacks soaps have a very nice earthy scent and are made with the core ingredients of traditionally native plants of red palm oil and shea butter. Red palm oil is filled with natural vitamin E, alpha and beta carotene and other antioxidants, as well as essential fatty acids. Shea butter, is also a very potent nut that is used as the base ingredients to make this black soap so magical for radiant, acne free and youthful skin.